They eat French fries fallen on the ground near fast-food restaurants. They thrive in dumps and whitewash unsuspecting sunbathers at the beach. And for the most part, they are regarded as urban pests. They are also my favorite photographic subject! The Ring-billed Gull is common as dirt where I live, and loathed (at best) by most people. But to me they present the ultimate photographic challenge: to make outstanding photographs of an otherwise ordinary species. 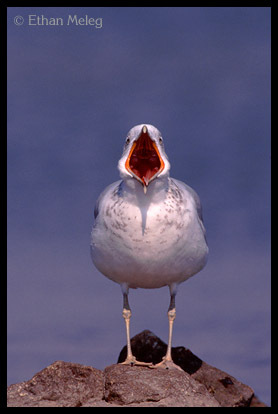 My files are filled with photographs of Ring-billed Gulls in a myriad of poses, plumages and locations. In fact, I have more photos of this species than any other subject! You’re probably thinking that I’m crazy - caught in a photographic craze - hiding out at dumps and sewage ponds. Well, yes I do visit these places to photograph gulls. Anywhere I can get close to gulls is a place that I like! To get to the main point here... I firmly believe that the best way to improve as a nature photographer is to spend time photographing the common species found near your home. Practice and get to know them. You may not need to go any farther than your backyard, a local park, zoo or that little pocket of habitat on your way to work. Each of these places is home to numerous good photographic subjects. 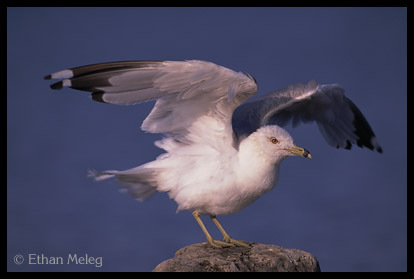 You may even have Ring-billed Gulls in your neighborhood! But to me, the single biggest benefit of photographing the wildlife near home is that you get to know these species very well. Over time you’ll discover, for instance, that Ring-billed Gulls usually stretch their wings after yawning.... or that they flinch downwards before launching into flight. This kind of knowledge will leave you prepared to make that incredible shot when the bird does something spectacular. Heck, you might even make a photo that captures the personality of an individual bird you’ve been watching for a long time. This is the essence of nature photography!